Orange textile cable (5 meters). Buy online. The price corresponds to 5 meters of cable. (1 unit = 1 blister of 5 meters). Number of threads: 2x0.75 mm. Longitud: 5 meters (presentado en blíster). 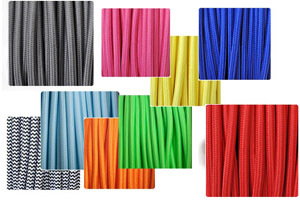 * The actual color of the textile cables displayed on Wonderlamp.shop due to the configuration of the screen may differ slightly from that displayed on your computer. If you are not sure how to connect the cables securely, please contact a professional electrician for assembly.